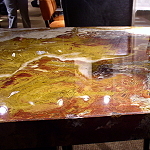 Polished natural earth stone. 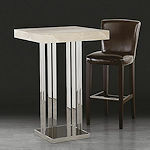 Each table custom made in Italy any stone. Production and custom sizes available. Top or base sold separately. Mined from an old river bed near Rome, Italy. are available in ANY stone. Custom made earth stone in Italy. See Stone Samples. 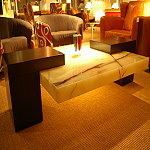 The lighted stone pedestals are really stunning especially in onyx. Onyx is a semi-precious stone meaning light passes through it. 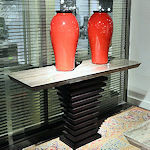 All tables shown above can be ordered in ANY stone. 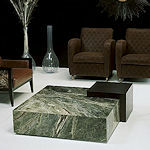 Custom made earth stone in Italy. See Stone Samples. Imperador marble is one of the most popular. And the grey stripes marble is too. Crystal stone has Swarovski crystal embedded in the stone. See Stone Samples. in ancient Rome. Travertine has pitted holes and troughs in its surface that occur in nature. Pure travertine is white. It is also found in tan, brown, and cream-colored. See Stone Samples. 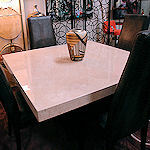 Travertine is used indoor or outdoor like all of our natural earth stones. 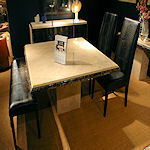 Travertine is one of the most stone floor or furniture. 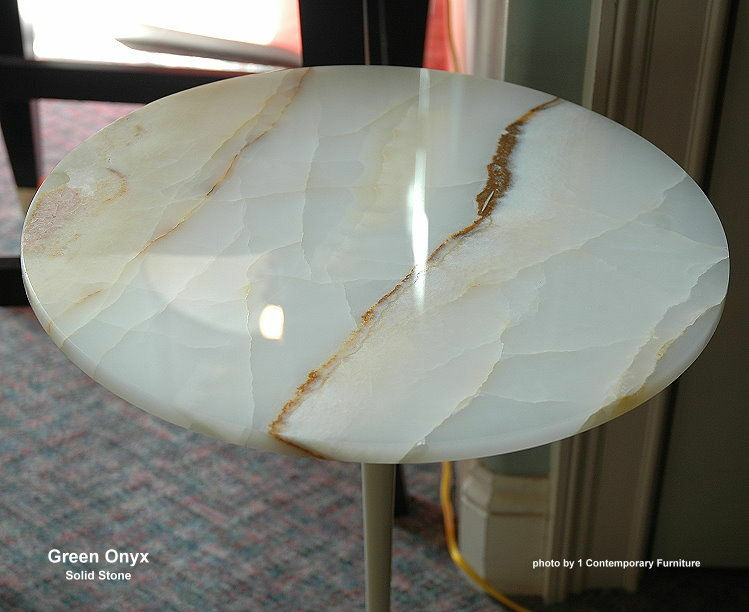 This beautiful green onyx table is not cracked. It contains striations (or fissures) common to all natural earth stone. This table is in perfect condition. MATERIALS: Natural Earth Stone. 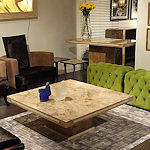 The Italian stone products are all natural earth stone presenting all the variations and unique colorings found in nature. Because they are natural products, no two pieces will look alike. 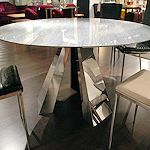 None of the natural veins, pores, and variations are to be considered defects, but instead characteristics that make your table on-of-a-kind and enhance its beauty. 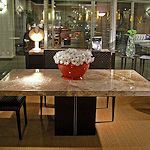 In addition to the Italian earth stone above, 1 Contemporary sells a few man-made stone products that are clearly marked as such. Travertine: Travertine is a sedimentary rock that is naturally porous. Some of the open pores and veins may be filled in manufacturing. 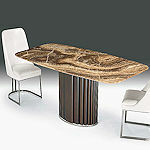 The color of the veins and the amount of fill needed depend entirely on the nature of the particular travertine top. 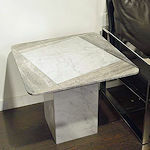 Dark veins may randomly occur on the table top or edge of the table depending only on the mineral content present in that particular piece of stone. In some instances, tiny openings are not filled and remain open. 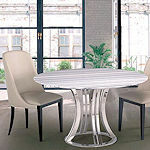 Open pores on the edges of the table are not filled to leave the piece in its natural state. 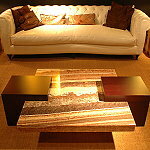 Walnut Travertine: The brown color of walnut travertine is natural to the stone. 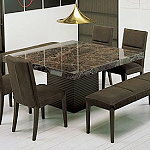 As in all stones, the color is determined by the mineral content present in the earth during its formation, and in this stone can vary from beige to dark brown and from light gray to black. Because of the vast variations in color present in this particular stone, we use a clear resin to fill the natural pores. 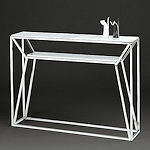 This clear resin enhances the depth of color and provides a relatively uniform shine. 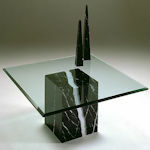 Because the fill material is clear, some areas require that we use fragments of the stone itself to occupy the resin. These fragments are hand placed and their size and density will vary. In addition, the seam between the stone and the fill can sometimes leave a notable transition that could be mistaken for a crack. 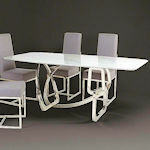 This notable transition is unavoidable when it occurs and does not sacrifice the stability of your table in any way. Tivoli: Tivoli is a variation of natural travertine. It is a sedimentary rock that is also naturally porous. Slabs are cut against the natural course of the veins and as a result the appearance will show a cloudy effect where darker areas might also be present depending on the mineral content found in that particular piece of stone. Tivoli Crystallized: Tivoli Crystallized is a stone treatment achieved combining the Tivoli stone with natural crystals. 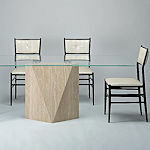 Crystals are manually placed in the natural cavities and pores of the Tivoli slabs. 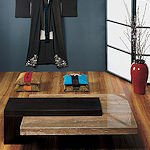 The surface is then covered with a product especially developed to maintain the natural shine of the crystals. The liquid fills in the cavities and open pores of the Tivoli without affecting the reflecting features of the crystals. The slab will then go through a series of processes with high and low temperatures to harden the liquid used on the surface and it is then polished with a buffer to generate the great effect of the Tivoli Crystallized. 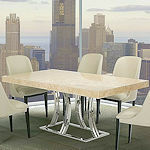 Marble: Marbles come in many natural colors and each presents natural veining. The coloration and veining are all determined by the minerals present during formation. Veining can often provide a certain inconsistency in the surface texture of your table top and might even require some fill to be used. These variations and natural markings are to be expected. 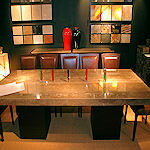 Granite tends to be the hardest and most regular stone that we use in our manufacturing. The color and surface are mostly consistent, although natural intrusions are always possible. 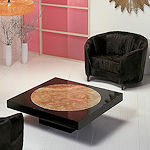 Onyx: Part of the alabaster family, onyx gets its brilliant colors from minerals and elements in the earth. 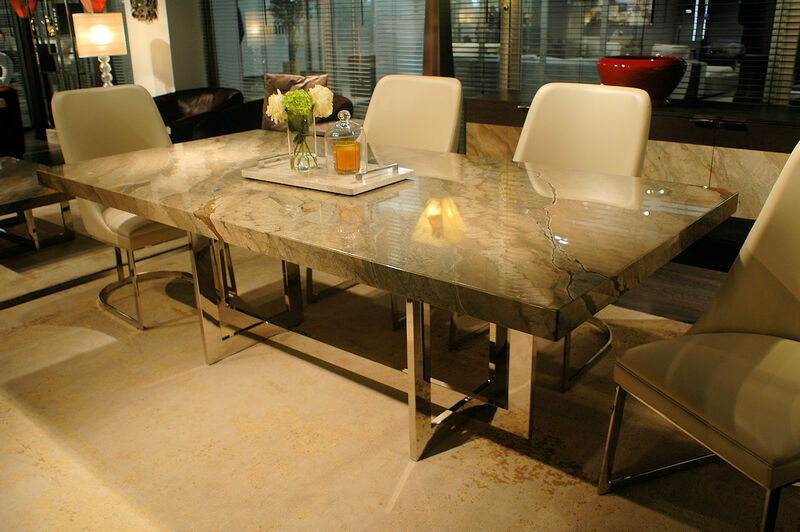 While extraordinarily beautiful, this material can vary considerably from slab to slab. Natural fault lines and small cracks are quite common to this material and not to be considered manufacturer defect. Polishing this extremely dense stone renders a stunning glass-like finish. Enjoy the variations of each piece of onyx, as each is as unique as the person buying it. Desert Stone: A fossil stone that contains fossils that predate the dinosaur period and are up to 450 million years old. See AMMONITES & ORTHOCERAS These fossils come from the Atlas Mountains at the edge of the Sahara Desert in Morocco. 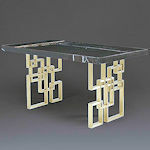 The dining, console, and coffee tables are custom made in Italy. 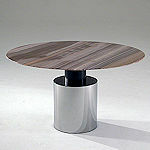 Note: Because our tables are all naturally polished, the polish will vary across your table top. 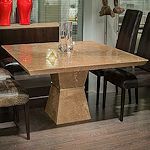 This is simply a result of a natural polish on a natural stone and one more way to emphasize the inherent unique beauty of each table. 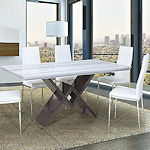 Caring for your table: You can re-polish your table with a coat of natural paste wax as desired. This will restore the shine and protect the surface. As you would with a fine piece of wood furniture, always use place mats, coasters, and trivets and clean any spills immediately. Regular rubbing alcohol is a perfect product to use for day-to-day cleaning. For stains: The removal of light rings and slight stains is fairly simple. Try the finest sandpaper available with a light-handed application and the re-wax. If it is an absorbed stain, the application of small amount of hydrogen peroxide, diluted bleach, or ammonia to the stain with a soft cloth produces good results. Always wash with clear water and wipe with a dry cloth, and re-wax after any cleaning or repair. To fill small holes: Fill opening with a hardening putty, fill-stick, or spackle with color. You may need to remove excess with a razor blade of very fine sand paper. When surface is completely dry, apply paste wax and polish. 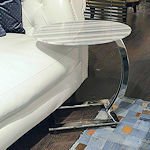 © 2018 1 Contemporary Furniture ® / all rights reserved worldwide.